Do you love slings and helping new mums and dads carry their babies? Bamboozled by the range of slings available? Unsure how to use slings, how to help parents choose the right one for them and use it safely? This workshop is perfect for doulas, midwives, antenatal teachers, breastfeeding counsellors, slingmeet and sling library helpers, or anybody who works with new parents and wants to support them on their babywearing journey. During this fun, informative and practical one day workshop, you will learn to carry a baby on your front using the 4 main types of sling available (wraps, ring slings, Meitais and buckle carriers). At the end of this day you will have all the knowledge you need to not only choose and use a sling for yourself, but to help new parents do that too, in a way that is both sensitive and empowering. These workshops are run under the Born to Carry initiative, and give you access to insurance. The cost is £120 per person and includes an extensive handout and access to a private facebook group. I am slowly winding down the babywearing side of my work, to make room for new developments. I will not be advertising workshops, but I am happy to run them on demand if there is a group of 6-10 people who are interested. If you would like to attend or organise one of these workshops, please contact me. 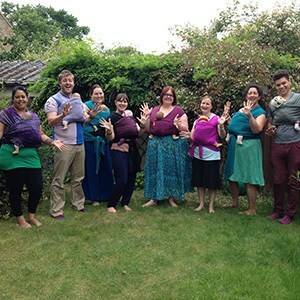 Sign up for more details about forthcoming Workshops and get 3 rebozo Techniques you can use in pregnacy and labour! "Loved it, you're a great speaker, a real natural. Enjoyed learning from you"
"I found the theory and science very helpful. The practice with each carrier gave me ideas on how to use them"
"Loved the combination of practical, theory, plus the role play-feel very confident about supporting parents"
"Has given me the confidence to use the skills and knowledge I have. A very good overview of a varied range of carriers and some good theory and history"
"Very good, very enjoyable and informative. I enjoyed both the practical and theoretical elements. I feel I have good knowledge to help someone get started on their babywearing journey. I think I know the best way to communicate with babywearing parents"
"Super useful info, shared in a very understandable easy way. Thank you so much for the inspiration"
"What a fantastic day! It was great to try each of the different slings"
"I thoroughly enjoyed this workshop. I enjoyed the teaching style and the historical and scientific context. The practical side was invaluable. Thank you Sophie!"